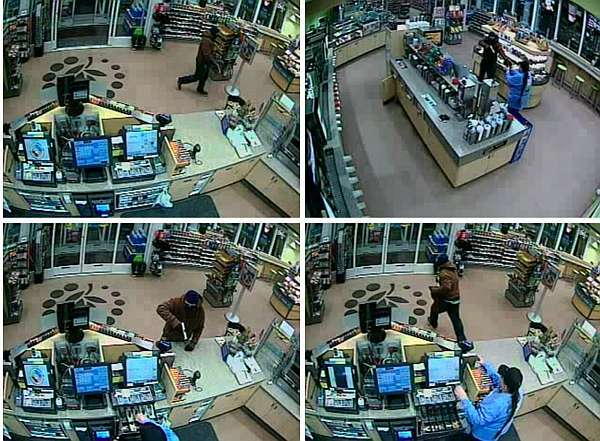 On January 15, 2017 at approximately 1:00 AM an armed male individual entered Cumberland Farms located at 1167 Hartford Avenue in White River Junction, Vermont. This male held the clerk at gunpoint and handed her a bag, instructing her to fill the bag with cash. The male was wearing a brown hooded jacket, ski mask, gloves, dark pants and sneakers. The clerk described him to be a white male, approximately 5’6, 180lbs, fair skinned with blue eyes and possibly strawberry blonde hair. The gun appeared to be a stainless or chrome, large framed automatic pistol. Surveillance video shows the male entering the area on foot and fleeing on foot. He fled with an undisclosed amount of cash. Anyone with any information is urged to call the Hartford Police Department at 802-295-9425.